The location of the Quidditch World Cup is simply described as "a nice deserted moor" but we know a little more about it than that. Firstly, we know that this is the third week in August. On the day that Harry's scar hurt him he thinks that he has a fortnight to go before term starts, i.e. before the first of September, and in the wee small hours of the morning after the first (and, as it turned out, only) match at the World Cup, he thinks that it is three days since his scar hurt him. They don't even set out for the match, from the campsite, until it is properly dark and then they have a twenty-minute walk through the woods; finding their seats; the whole of the Quidditch match; the walk back; quite a long conversation rehashing the match; a period in bed which may include an unknown interval of sleep; Arthur waking them all; the Death Eater wannabees floating the Robertses above the camp; the flight into the woods; the incident of the Dark Mark and the emergency inquest which followed it; "a few hours" of sleep; the walk back to the Portkey point (which we know is twenty minutes' walk from the start of the campsite) and a walk down Stoatshead Hill and through Ottery St Catchpole, by which point it is dawn. So, although we do not know which moor the match was held on, we do know that there were something around eight or nine hours after it got properly dark and before the following dawn at Ottery St Catchpole, which would have been around 5:10am. It's usually reckoned to get dark around an hour after sunset, so sunset had been about nine or ten hours prior to that, or around 7pm-8pm. That doesn't help much because the range of sunset times from the south of England to the north of Scotland was from about 7:20pm to 7:50pm respectively, but we also have to consider that the further north you go, in summer, the lighter it is at night and the longer it takes to get dark so darkness in the north of Scotland would probably have been later than 9pm. So although it's not hard and fast we should probably prefer a location in England to one in the north because it gives us more darkness to play with, to fit in all the events of that turbulent night. It is apparent that Mr Roberts is used to dealing with campers - this is a regular campsite and he is described as "the campsite manager". At the same time he is surprised by the number of people pre-booking, by the party atmosphere and by their bizarre clothes, so this is not a regular pop-festival site: the campers he is used to hosting are presumably tourists. So this is in a fairly tourist-friendly area, the sort of place where people camp and then go on long, improving walks, albeit that we're told the moor itself is deserted. It's not as deserted as all that, though: the stone cottage and the field with gates into it are presumably a farm which has been converted to farming grockles; and there's an actual tap which suggests the place is on running water, and no other apparent amenities, which suggests there must be shops or something within walking distance to cater to the tourists. [cut] they finally managed to erect a pair of shabby two-man tents. [they] found themselves in the shadow of a gigantic stadium. [Harry] could tell that ten cathedrals would fit comfortably inside it. And then there's Harry's strange thought about there being no other Muggles for "several acres". This is obviously another example of JKR, and Harry, having no idea what numbers and measurements look like. An acre is 4,280 square yards, or just over half a standard football pitch, and we are told, repeatedly, that there are around a hundred thousand people attending the match and, presumably, camping at the campsite. OK, most of the wizarding tents look like ordinary Muggle ones, and they can afford to be small because they can be bigger on the inside than the outside. We're told they are set up in rows, which means they don't need space between them at the sides except for the occasional cross-channel. But there's room in front of the tents for someone to cook on an open fire and other people to walk past, so the space between the rows must be at least six foot. Even of most of the tents are only six foot by four, and the Weasleys' five to a tent is standard, that's still around twenty thousand tents occupying a space twelve foot (including the space at the front) by four, or five and one third square yards each, or nearly one hundred and seven thousand square yards, or twenty-five acres, or twelve and a half football pitches. And in fact they're probably not that crowded - it's more probable that the field is about forty acres, which means that if it's squarish it's about four hundred yards to a side. So the nearest real Muggle for several acres would be only partway into the field and, indeed, we know that Mr Roberts has a wife and children near at hand. Nevertheless, ridiculous though it is, the fact that Harry uses acres as a measure of where the nearest other Muggles are, rather than miles, suggests that there are other farms or villages quite nearby - perhaps that he can see some in the distance - and that would make sense of the presence of a large campsite whose amenities seem to consist of one tap. There must be shops etc within a few miles. [cut] he realised that this was not the Forbidden Forest: the trees looked younger, they were more widely spaced, the ground clearer. There's also the Quidditch pitch to consider. According to Quidditch Through the Ages a standard pitch is 500ft long and 180ft wide, but you also have to allow space for multiple rows of stands to seat ten thousand people, pluse there's probably some space between the lowest stands and the pitch proper. Overall, the stadium for the World Cup is probably around 300ft by 600ft-plus, or 100 yards by 200 yards. What else do we know? We know that Harry and co. arrive in a deserted area and then walk for twenty minutes - allowing for the thick mist slowing them down a bit, about half a mile or a little more - before they arrive at the campsite. There is a stone cottage, and beyond it a campsite in a field with some sort of barrier round it, since it has a gate or gates. The field, which is probably about forty acres, stretches up a gentle slope crowned with a dark wood. The wood is quite large: it takes twenty minutes to walk through it and, OK, it's dark, but there's a path, and it's illuminated, and apparently it's not misty any more, so this transit time suggests the wood is nearly a mile across - although the fact that there were ten thousand people trying to crowd through the wood in the dark might have slowed things down a bit. 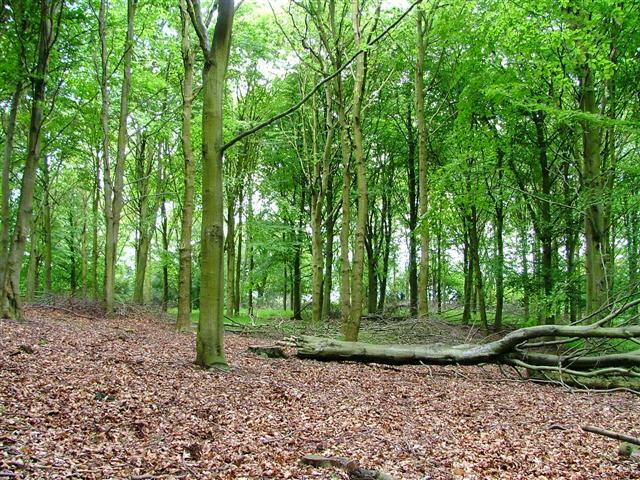 The trees are quite tall (Harry sees the leaf-canopy as "far above him") and they are primarily deciduous: the floor of the wood is scattered with leaves and twigs, not needles or fronds. In DH they arrive there on 2nd September (they invade the Ministry the day following the day we are told is the 1st, and escape to the woods immediately afterwards) and there are leaves on the ground: this is much too early to be leaves from that year so they must be left from the previous year, which tells us that the wood is fairly sheltered. It has bushes and gnarly roots but it is a much more open and younger wood than the Forbidden Forest. So, we're looking for a deciduous or partially deciduous woodland which crowns a gentle slope, fairly open and with youngish-looking trees and some bushy undergrowth, and large enough for it to take twenty minutes to walk across and for this not to be ridiculous (that is, it's not a mile long and fifty feet wide and they inexplicably chose to battle through its long axis rather than walking alongside it). 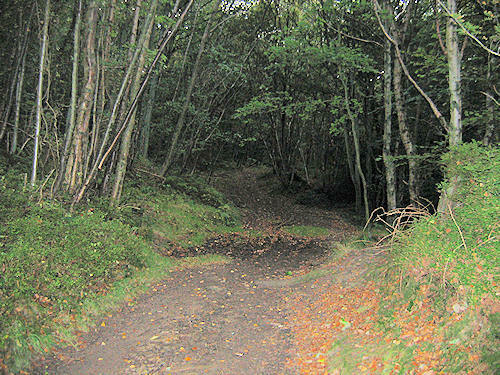 This woodland is on or adjacent to a moor which is big enough and empty enough for someone to arrive in what seems to be - as far as they can tell through the mist - an empty landscape, then walk for at least half a mile and arrive at the wood without encountering a village or town on the way. 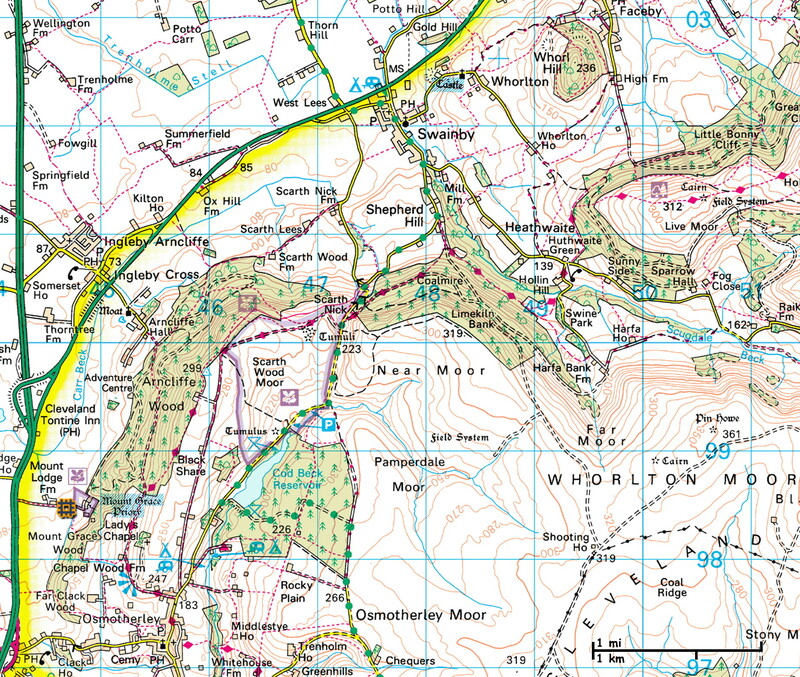 Since the moor is described as "deserted" we can presume the wood is not obviously surrounded by working farms. However, the moor is not completely uninhabited. It has been farmed in the past, at least, and there is a stone cottage at the foot of the slope which leads up to the wood. The slope is taken up by a field of at least twenty-five acres, probably a lot more, which is enclosed in some way and accessed by a gate, and which has been converted from farmland into a campsite, presumably for tourists or hill-walkers or similar. The campsite seems to have no facilities other than a tap: this suggests that not too far distant there is probably a village large enough to have at least a convenience store and a garage. It gets quite dark quite early, in the middle of August, so it's probably not the wilds of Caithness and Sutherland, and in any case the woodlands there seem to be the usual Forestry Commission corduroy ranks of Sitka spruce or larch. This is a much more difficult problem than it might at first appear. You would be amazed at how many large deciduous woodlands there aren't on British moorlands: or at least, not on moorlands harsh enough to qualify as "deserted". 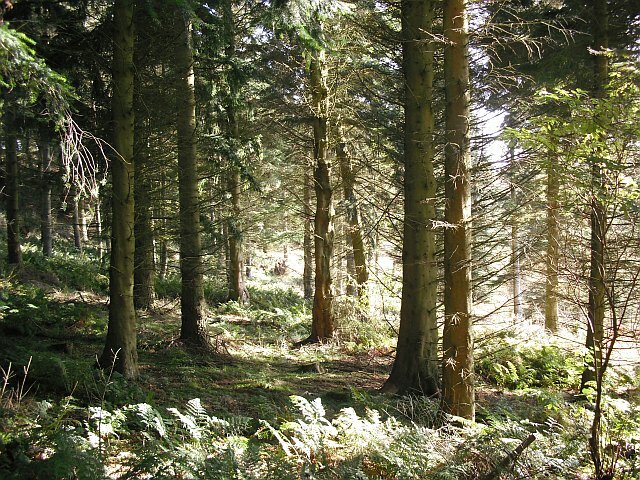 Any moor mild enough to support deciduous trees is likely to be heavily farmed, and nearly all sizeable woods on moorland are government-sponsored, artificial spruce-plantations. Furthermore, moors are almost by definition windy, and strong wind suppresses the growth of trees. Woods on moorlands, therefore, tend to be at the bottoms of slopes, in valleys - not on the crowns of hills. 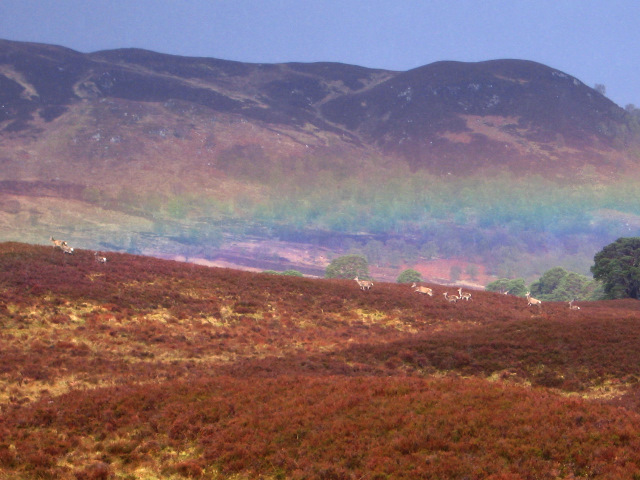 There are numerous large areas of moorland in Britain. 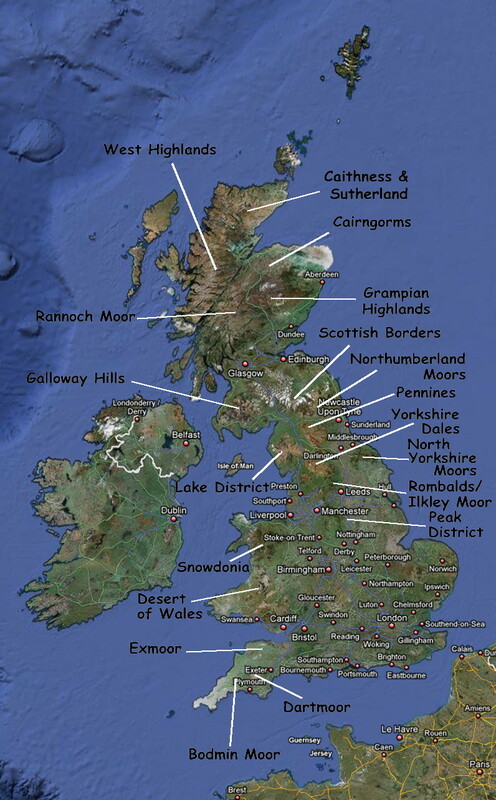 Even if we exclude Caithness and Sutherland because of the light issue, that still leaves Rannoch Moor, Bodmin Moor, Exmoor, Dartmoor, Rombalds/Ilkley Moor, the North Yorkshire Moors, the Northumberland Moors and many bare, mountainous regions which are not strictly moors but might loosely be mistaken for them - the Peak District, the Pennines, the Yorkshire Dales, Snowdonia, the Lake District, the Scottish Borders, the Galloway Hills and the large, empty central uplands of Carmarthen, nicknamed the "desert of Wales". And this is without even considering the moors of Ireland. Many of these can be ruled out because they seem to have no stands of trees anything like big enough for it to take twenty minutes to walk through them. The main thing about moorland, after all, is that it's pretty bare. Of those that do have large stands of trees, nearly always they are entirely or almost entirely coniferous (this applies to the northern Scottish ones as well, quite apart from the light issue); or they're at the bottom of a slope; or if they're at the top of a slope it's because that slope is too steep for trees to root on; or the area of the slope is substantially less than twenty-five acres; or they are surrounded by working farms and/or villages, roads, rivers, railway lines etc etc: often several of these problems at once. Finding woods which even might do at a pinch has been very difficult and involved a lot of poring over Ordnance Survey maps, looking for the little deciduous/coniferous signs. I wasted a great deal of time and effort on a deciduous wood south of a village called Horner, on Exmoor, which seemed like a good choice until minute examination of the OS map showed that what I had thought was a slope up to the trees was actually a slope down, and the only side of the woods where the land slopped up towards the trees was both far too small to support so many tents, and crammed right up against a fair-sized village. Forestry Commision conifers: endless miles of identical Christmas trees. And it isn't even any good to say that the leaves Harry was lying on came from the bushes: coniferous woods on moorlands are nearly always artificially-planted with foreign trees, and as such have little in the way of undergrowth. The fact that the wood near the World Cup stadium had bushes tall and dense enough to conceal a house-elf is more evidence that that wood was largely deciduous, or at least, that if it was a coniferous wood it was an old, native one - Scots pines or similar rather than Sitka spruce - and those are probably even rarer on moorland than deciduous woods. 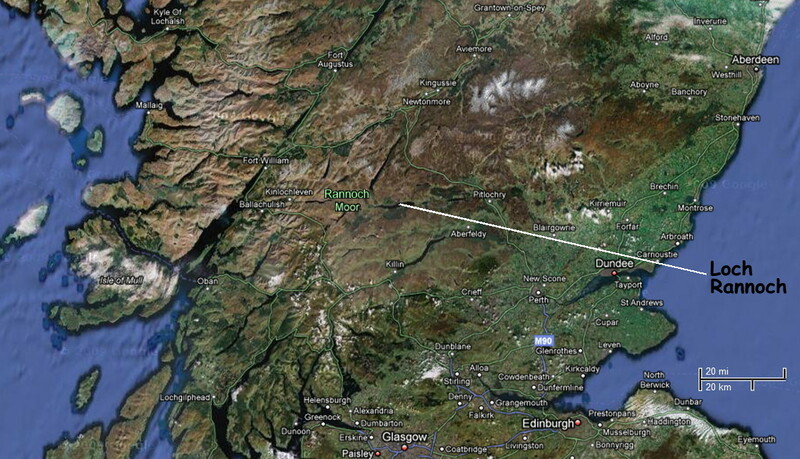 I thought for a while that I'd found a good candidate right on the border between Scotland and England. 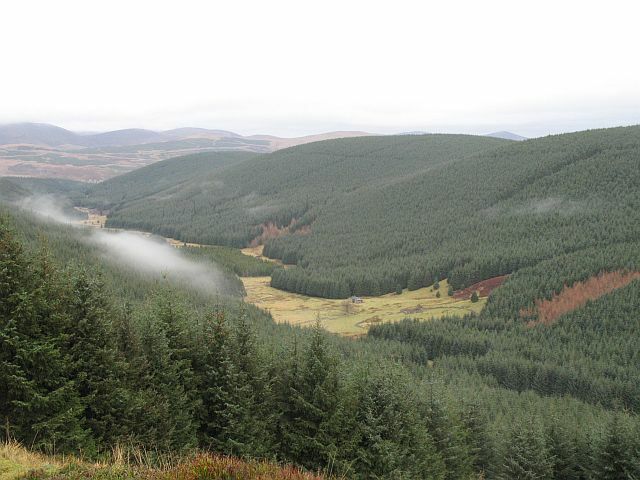 Redesdale Forest is coniferous but its northern part, near Catcleugh Reservoir, does have a significant deciduous area sticking off from it. It's not in itself big enough to take twenty minutes to walk through but there's nothing to say that all of the area of wood they walked through was deciduous: just the bit they Apparated back to after their escape from the Ministry. The area is fairly remote yet has a farm, Ramshope Farm, next to it, and it's spread across several hills one of which is charmingly called Harry's Pike. The problem with it is that there seems to be nowhere there where the woods would appear as crowning a hill - the angles are such that they would always be seen as running up the flank of a hill instead - and the hills they are flanking are very, very steep. I entertained some hopes of Ireland, where there are a lot of moors, or peat-bogs resembling moors. Unfortunately Southern Ireland isn't covered by the Ordnance Survey maps and is only very thinly covered by Geograph photographs, so the only way I could find out which blobs of woods might be deciduous and which artificial conifer plantations was to read up on articles about Irish woodland. The only significant deciduous wood on something resembling a moor that I managed to find was Brackloon Wood in County Mayo, a two-hundred acre native oak-wood at Knappaghmore in the foothills to the east of the mountain called Croagh Patrick. Unfortunately, however, although Brackloon Wood appears to sit over a low ridge it also seems to cover it all the way down to a level at which the land flattens out: there's no slope up to the trees. Rannoch Moor is so far north (east of Fort William) that it's really pushing it as far as the light issue is concerned, but I suppose it could have been a very overcast night, and in any case the options are strictly limited. I'm happy to take suggestions from people who know of suitable sites in their own area, but so far as I've been able to see by squinting at satellite photographs and Ordnance Survey maps, there are only five reasonable candidates anywhere in Britain: two of them on the North Yorkshire Moors, and three of them within the same small area near the south-west shore of Loch Rannoch, at or just beyond the extreme eastern end of Rannoch Moor, within a couple of miles of each other. And even these have their problems. 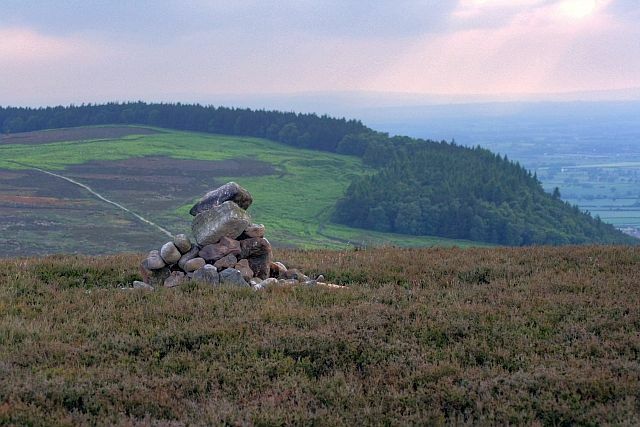 The first of the Yorkshire ones is on the far west side of the North Yorkshire Moors, just south of Swainby. South of the village the land rises up sharply to a curving escarpment of mostly bare, empty moorland called Far Moor, Near Moor and Scarth Wood Moor. This raised moor is surrounded by a broken semi-circle of trees, mostly conifers but with significant deciduous areas, which extend up the steep slope below the village, and hide the top of the moor from it. On the moor side the ground slopes down slightly, so the trees would be seen as being at the top of a shallow slope. 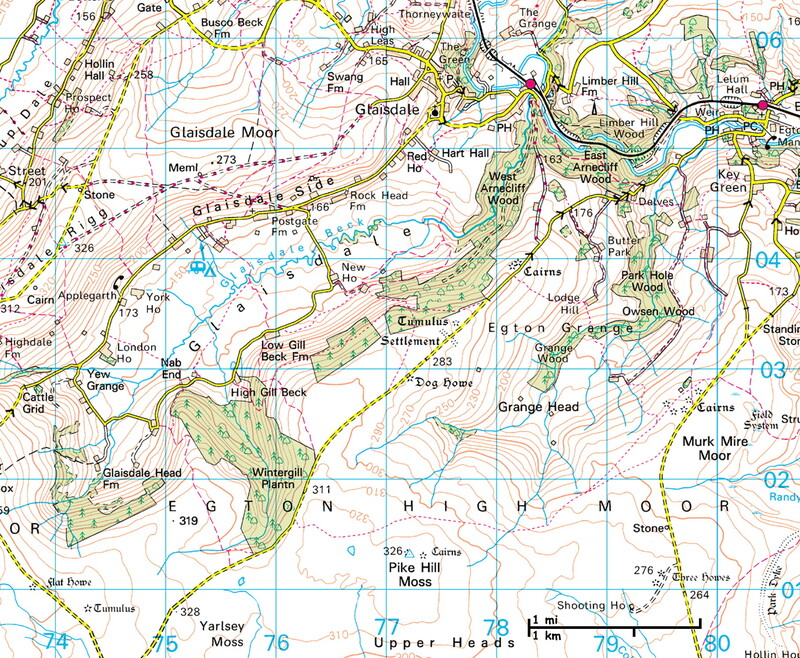 The slope of Near Moor is even helpfully labelled "field system", and there actually are campsites in the area, towards the bottom left of the map. There are only two problems with this area. One is that the woodlands are long but fairly narrow, which would mean the wizards had chosen to walk these woods lengthways. 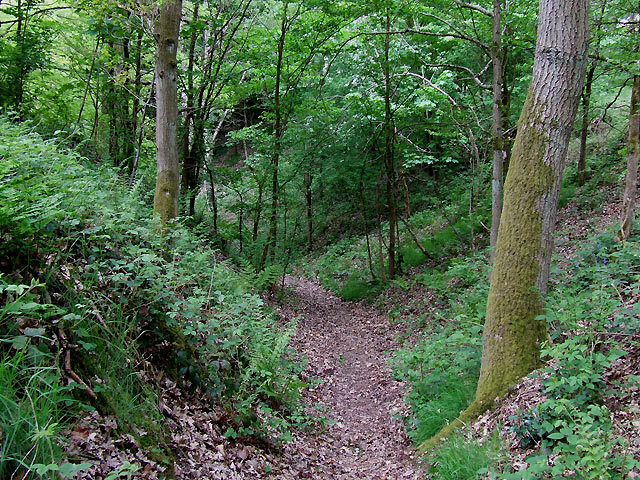 This isn't as unlikely as it sounds, though, because the largest area, Arncliffe Wood, has the scars of an old railway track or similar running through it longitudinally so one could just say the wizards chose to follow the Muggle paths. The other is that if they went through the woods to emerge on the other side, not only would they have to climb down the steep, wooded face of the escarpment, but also they would come out within spitting distance of Swainby, which is a fairly substantial village. Yet, they have to build, and conceal, a stadium about one hundred by two hundred yards and high enough for multiple tiers of seats, and it's on the other side of the woods from the campsite: which ought to mean either the stadium or the campsite is in full view of the village. 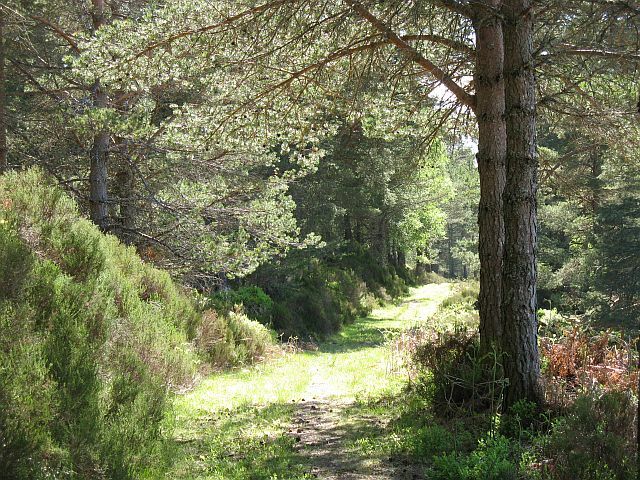 However, much of the wood is Forestry Commission spruces and it is apparent, looking at photographs taken of the area in different years, that swathes of trees are periodically harvested, resulting in random bare patches. It is conceivable - just - that the stadium wasn't built on the far side of the wood but in a conveniently-placed temporary clearing. It would still have to have some sort of concealment spell on it, though, to prevent its being visible to walkers on other hills in the area, if they were high enough to see over the trees. I thought at first that the wood round Cod Beck Reservoir might have been the one they walked through to get to the stadium - but that doesn't work because it's at the bottom of all slopes. 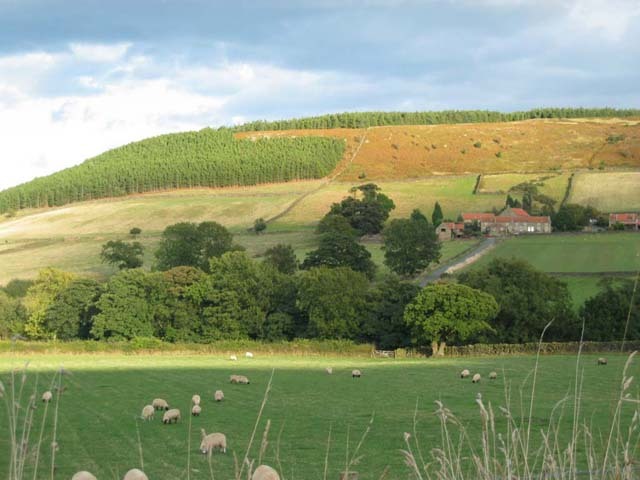 Then there's the Wintergill Plantation and its neighbours, West and East Arnecliff Woods, which are part of a similar arrangement around an escarpment at the edge of Egton High Moor, between Wheeldale Moor and Glaisdale (which is the name of both a dale and a village in that dale), about seven miles nor'nor'west of Cawthorne. This is much more in the middle of the North Yorkshire Moors than Swainby is. so that it's possible to walk from one side of the wood to the other and be on empty moorland on both sides. The campsite would probably be at the top of the area called Dog Howe on the map, and the stadium would be on the slope which rises beyond the south-west side of the plantation. The only problems with this one are that the stadium would have to be tucked around a bulge of slope and concealed from neighbouring Glaisdale Head Farm, and also the plantation is not all that big. Vaguely boot-shaped, it's about a mile long on its longest axis but only five hundred yards across at the "ankle", which is about where you'd expect them to be crossing to get to a likely site for the stadium. Even if they ended up walking the length of the "foot", which would take them out near a small ruin which is near the stream which emerges from the "toe", that would still only be a bit over half a mile. However, it would take them up and down slopes among the trees and across a stream, and there were ten thousand people filing through the wood in the semi-dark and trying to find seats, so it might have taken twenty minutes to get through the wood. On the whole, this Wheeldale Moor/Wintergill Plantation option is probably the better of the two Yorkshire sites, despite some minor problems. 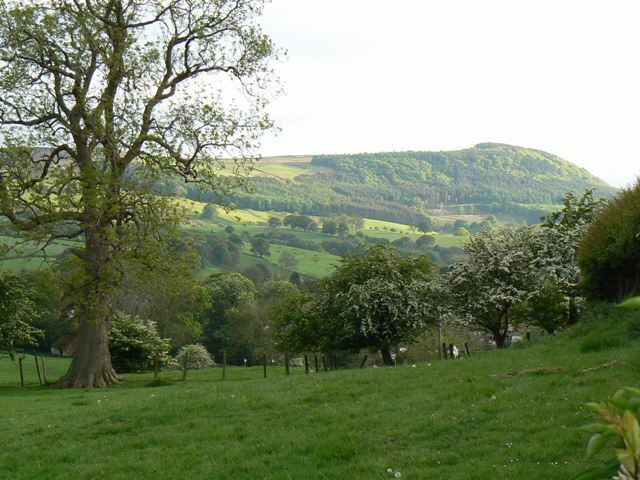 It's by no means totally isolated, since the village of Glaisdale would be only about a mile from the campsite and there are several farms below the escarpment. But despite both Arthur and Harry thinking of the moor as "deserted" it's canon that it's not as deserted as all that, since there is a tourist campsite on it, and it has clearly been farmed at some point. And with either of these locations, it would actually make some kind of sense for Harry to think that there would be no other Muggles but Mr Roberts for "several acres" - Muggle farms would be only a few hundred yards away on the far side of the woods, but also hundreds of feet lower down and effectively in another world. Rannoch Moor is a flat, boggy, roughly triangular tableland of about sixty square miles, a thousand feet above sea level and surrounded by even higher mountains. Strictly speaking it ends just about where Loch Rannoch begins, so these three possible sites, clustered around the hamlet of Camghouran on the shore of the loch, are not exactly on the moor - but they are within a mile or two of it. The first possible area is the triangle of land where Camghouran itself is located, which slopes up nicely towards a deciduous wood south-east of the hamlet. The problems with this area are threefold: the campsite would have to be next to Camghouran itself; you would have thought Harry would have mentioned that there was a socking-great mile-wide loch just down-slope from the campsite; and as the triangle of land is entirely surrounded by trees Harry and co. would have had to walk through trees to get there, which you would think would have been mentioned - albeit there's a point where they could cut through a band of woods only about three hundred yards across, and the wood on the west side is sparse. Its great plus is that there is a sizeable clearing just under half a mile into the woods east-south-east of Camghouran, where they could easily have sited the stadium - although you would have to assume Arthur was speaking loosely when he said that the stadium was "on the other side" of the wood. 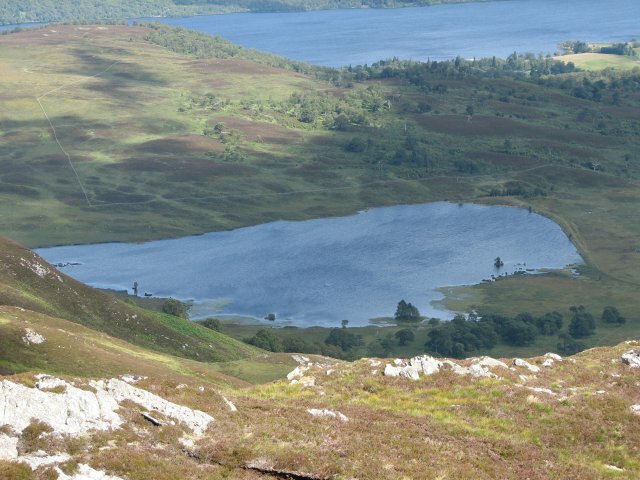 Possibility two is the skirt of land which rises towards Coille More to the north-east of the little lochs Finnart and Monaghan. On the map this looks almost ideal, but it has two problems. One is that the trees apparently don't quite grow all the way to the top of the hill. Seen from downslope there would be a slight rise of land in front of them, so whether you could still look up the slope and see it crowned with a dark wood would depend on how tall the trees are. The other is that if you walked through the trees from the slope where the camp would be, you would either end up in the loch, or at Camghouran, where there would be Muggle witnesses, albeit probably not very many. 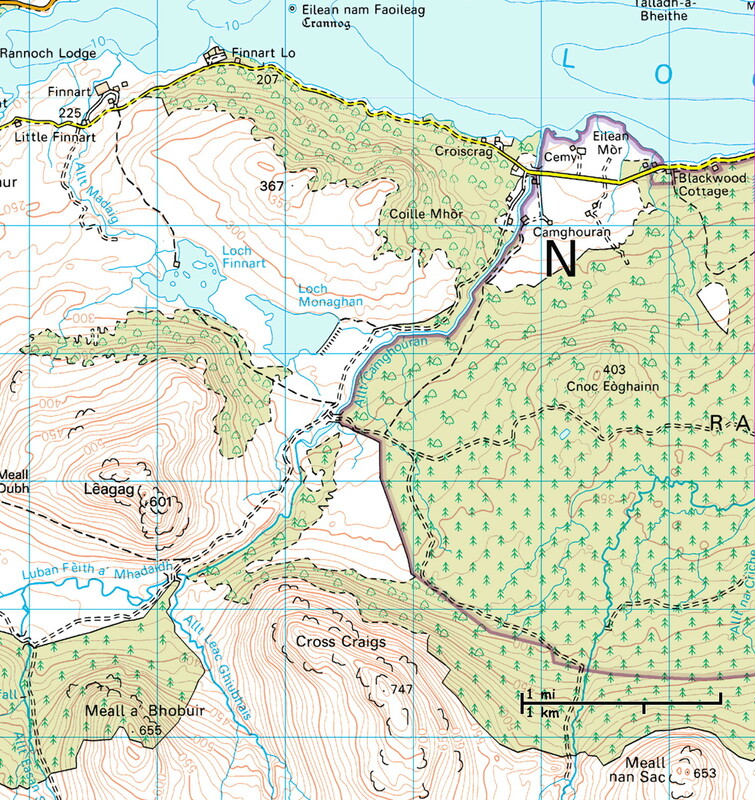 The third possibility is the triangle of land on the northern slope of Cross Craigs, which can be seen just below the middle of the map. Again, it's surrounded by trees but in this case there's a gap, so Harry and co. could have got into the area without walking through more than a few yards of wood - although they would have had to cross a small bridge. There are no houses in the triangle (Mr Roberts' cottage existing only in the Potterverse), so it's about as remote as anywhere with a campsite on it could be. This is the best of the three as far as isolation goes, since it doesn't require either the campsite or the stadium to be mixed up with Camghouran. 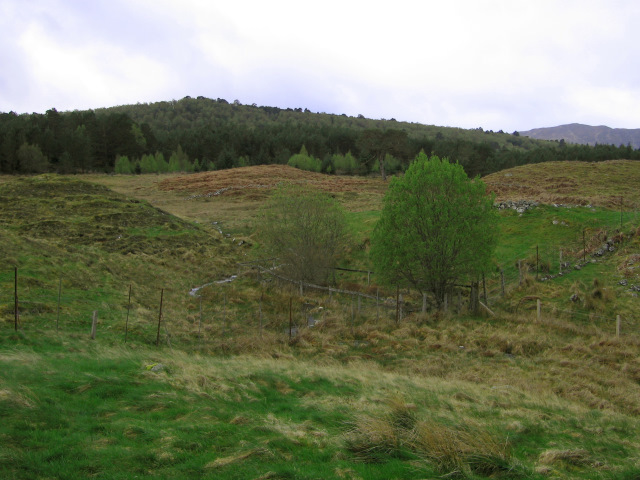 They would walk south-east through the woods, slowed by the fact that they were climbing the flank of Cross Craigs under cover of the trees, and emerge by a stadium which would probably be beside the stream between Cross Craigs and Meall nan Sac. The only real disadvantage of this site is that the whole campsite and the wood beyond it would be loomed over by Cross Craigs and you'd think Harry would have mentioned it. (so covering the period of the World Cup) there was a small independent boarding school on the south side of the loch about two and a half miles east of Camghouran, although of course the students wouldn't have been there in August anyway. and the Geograph photographs tend to confirm this. 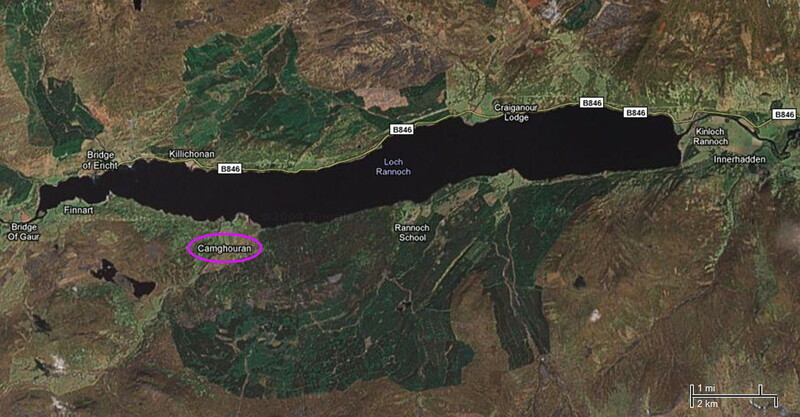 However, the Black Wood of Rannoch, south-east of Camghouran, looks convincingly solid: so perhaps we can speculate that in the alternative reality of the Potterverse Mr Roberts lived in the house at Camghouran, and Harry forgot to mention that the campsite faced out over a large loch. The Black Wood is mostly native pines with a few deciduous trees and although the bit of the wood where the Trio ended up after they fled the Ministry was deciduous enough to have leaves on the ground, in this case the area where Winky hid in the bushes could have been coniferous, since the Black Wood, being native forest, has well-developed undergrowth. There seem to be no sites anywhere in Britain which fit the description of the site of the Quidditch World Cup very well, but there are a few places which can just about be shoe-horned into it with a bit of special pleading. 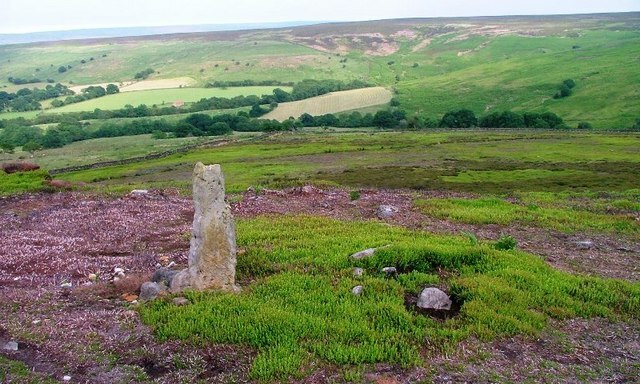 1) The campsite was on Egton High Moor above Glaisdale on the North Yorkshire Moors. The visitors Portkeyed to a point somewhere on Wheeldale Moor and walked north or north-west to the campsite, where they camped on the slope on the north-east side of Wintergill Plantation. To get to the stadium they walked through Wintergill Plantation to a point near the stream which emerges from the south-west corner of the plantation. There are no massive problems with this although the area has rather a lot of farms in it to be called "deserted", and the plantation is a little on the small side to match what's in the books and most of it is rather obviously artificially-planted spruce trees. 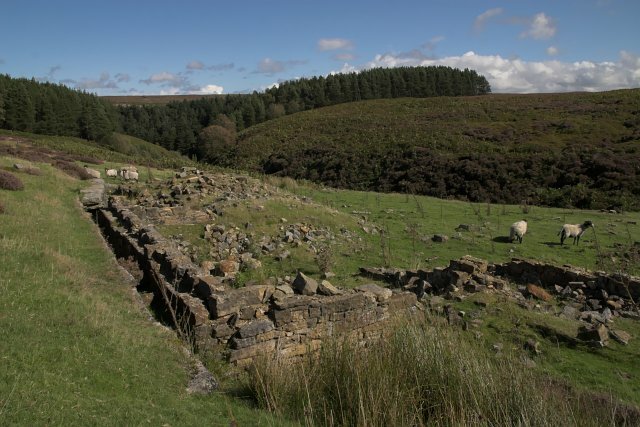 2) The campsite was at Scarth Wood Moor near Swainby on the North Yorkshire Moors, and the tents were pitched on land sloping up towards Arncliffe Wood. 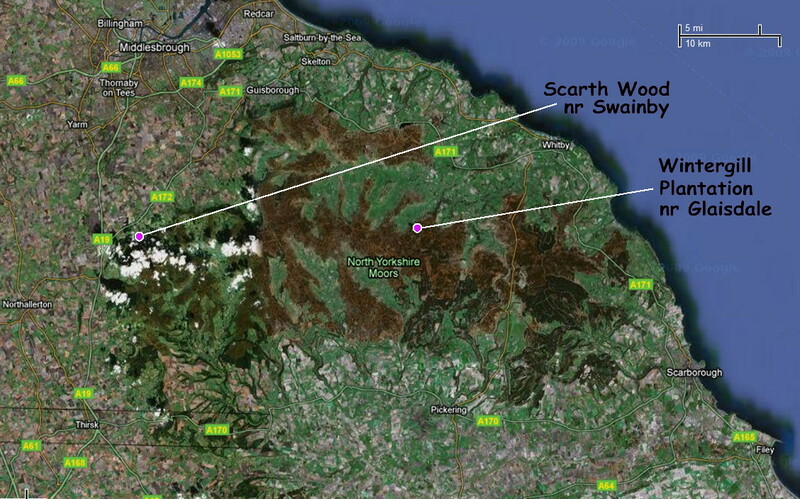 The travellers landed on Whorlton Moor and walked north-west. To get to the stadium they walked through Arncliffe Wood lengthways. The advantage of this is that there is a very nice smooth green slope up to the trees, and there genuinely are a couple of tourist campsites and the remains of old field systems around there. The big disadvatage is that the woods are an awkward shape and draped down a steep slope, and the deciduous areas seem to be on the low side of the slope. 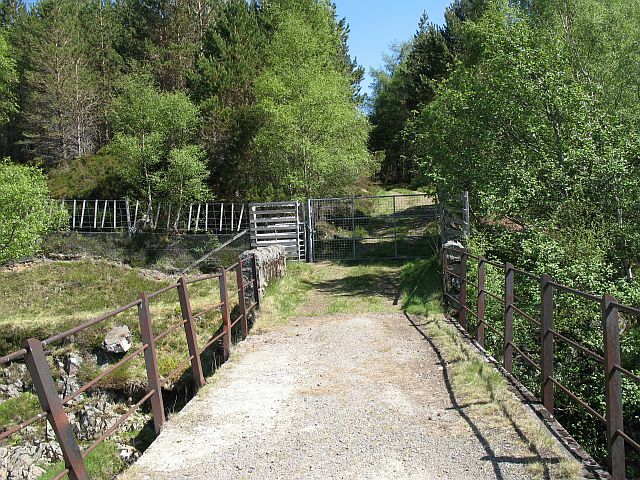 3) The campsite was on the rolling ground above Camghouran and below the Black Wood of Rannoch on the south-west shore of Loch Rannoch in central Scotland, just off the eastern end of Rannoch Moor. 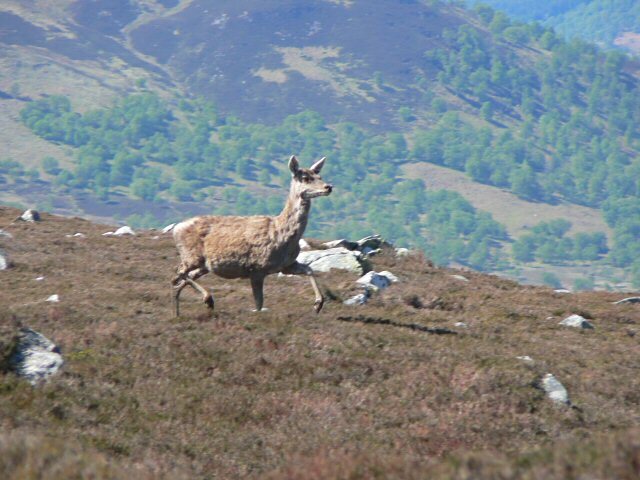 The visitors Portkeyed to Rannoch Moor and walked in, passing through a narrow belt of trees on the way. To get to the stadium they walked through the Black Wood of Rannoch to a large clearing. This site has the advantage of a wonderfully large and fairly dense mixed deciduous and coniferous wood at the top of a slope, albeit rather a lumpy slope to stick tents on. 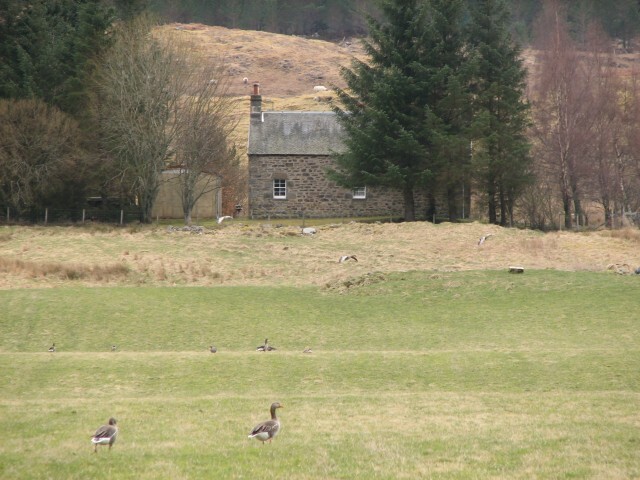 Its disadvantages are that there would be several houses near the campsite, not just one - and that it would require Harry/the author not to have commented on the fact that the campsite faced out over a mile-wide loch.